Dramatic color enhanced quartz crystal "black" or blacking doesn't express the brilliant metalic golds, purples, greens, and reds that shimmer on these real formations. 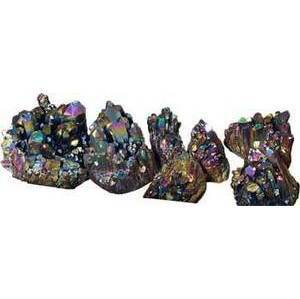 Each is a creation from millions of years ago now clusters of distinct varying angles reflecting light. Due to the many different sizes we are selling them in 5 pound lots.